A view of the whole complex taken from Signal Hill. In the background is Table Bay and the Milnerton coastline. 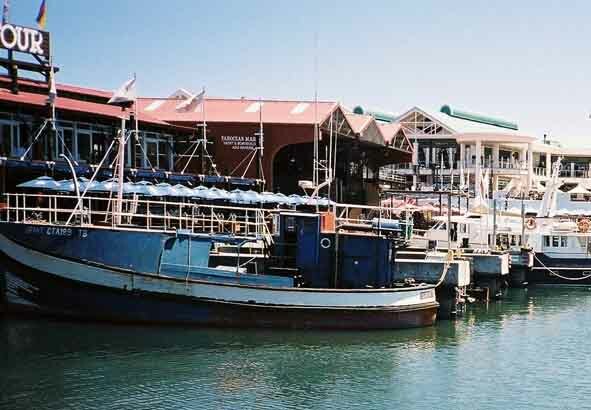 This part of the Cape Town docks fell into disrepair and was becoming an eyesore. Authorities wanted to clean up the dockland area and what you are seeing in these photos is the result of the cleanup. 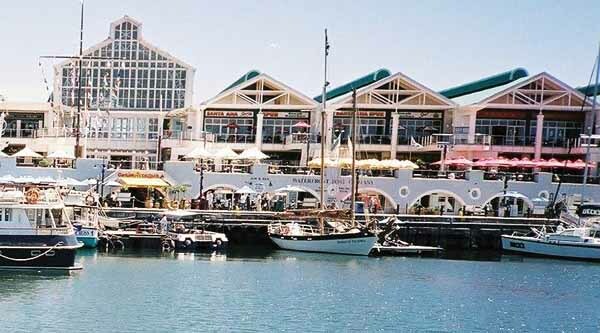 The V and A Waterfront is a working harbour and is utilised daily by ships and boats. The buildings you see in the photos were once warehouses that had become tumble down and have now been refurbished and house many shops, offices and restaurants.There are a number of new buildings as well! What used to be a dead area of Cape Town has now become one of its main attractions. It is safe to visit even at night and is one place that all visitors to Cape Town should spend some time. The wall is about 1.5 kilometres long and extends out into Table Bay. It is a good place to go fishing but unfortunately restrictions have been placed on access onto it as people have been washed off it during stormy weather. In the foreground are some of the dollosse that were designed by a South African engineer and are now used all over the world. The harbour looking southwards from Quay 5. 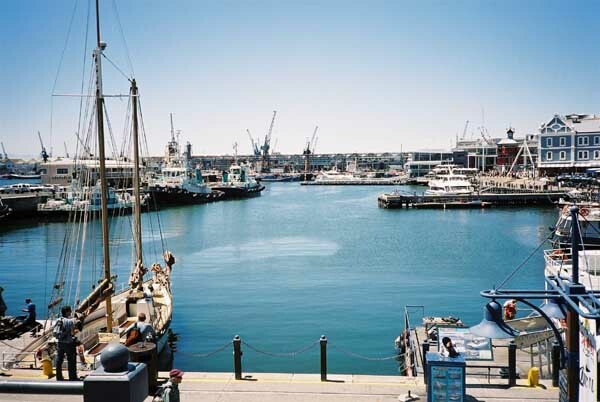 This little basin is one of the busiest areas of the harbour. Most of the boat trips leave from here and as you can see the harbour tugs are also berthed here. The main shopping area is situated on Quay 5. There is an outside auditorium to the left of the picture where free shows and musical concerts are held during the summer months. The little archways just behind the yachts are offices, restaurants and shops. The buildings to the rear are the main shopping areas which contain hundreds of small shops, restaurants and cinemas. Quay four forms the western side of the main basin. It is utilised as an outdoor restaurant and the Sea Rescue institute also has a warehouse on it where its rescue boats are housed. This is one of the oldest buildings in the complex. 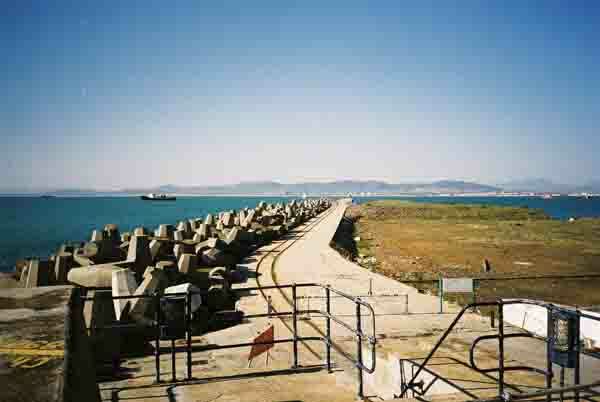 The whole area around it has been refurbished and the Nelson Mandela Gateway to Robben Island is closeby. This building has only recently been completed and used as the gateway to Robben Island. 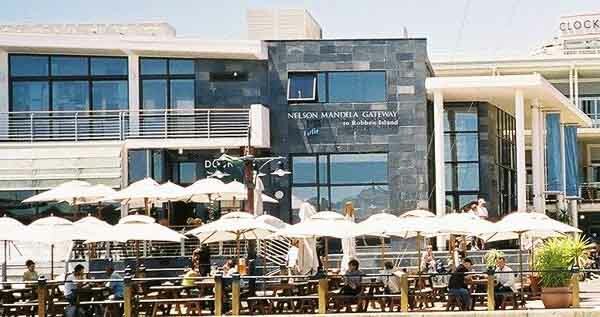 The building also houses the information bureau where visitors can get brochures on things to do and see in Cape Town. 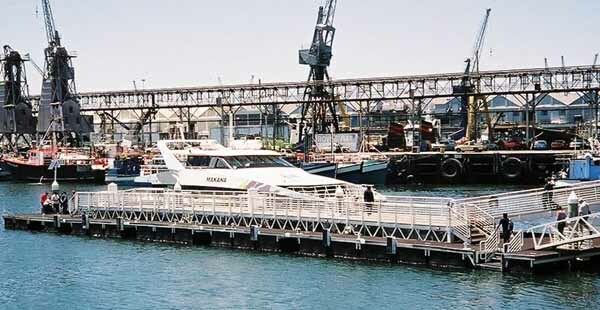 This is one of the two ferries that transport visitors to and from Robben Island. A trip that takes about 20 minutes. In the background is part of the fishing harbour with the lattice work that houses water pipes and pipes that move the fish from the trawlers to the warehouses on the quay. The Gateway and this jetty are built where Berties Landing used to be. 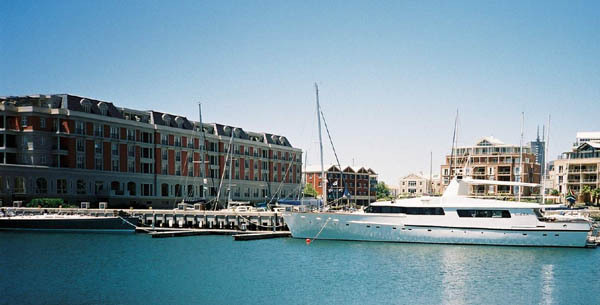 For those who can remember Bertie Reed the owner used to be one of South Africa's top solo yachtsmen. In this photo is a pedestrian bridge which is moved out of the way when ships want to move through the channel between Quay 4 and the Nelson Mandela Gateway and Clock Tower. Before this bridge was built people used the "Penny ferry" which was an old life boat that was rowed across the channel to fetch and take people. The building on the left is an example of one of the refurbished buildings dotted about the harbour complex. After moving through underneath the pedestrian bridge we enter the second basin in the Waterfront where a number of hotels are situated. 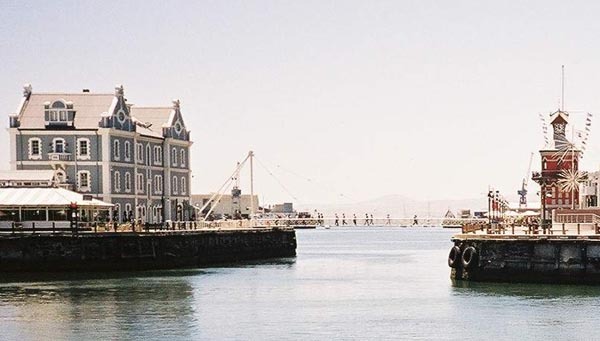 ( See our first photo of the V and A Waterfront. We are now in the middle basin) The Victoria and Alfred Hotel was also once an old warehouse which has been beautifully restored. The upper floors are the hotel while the ground floor contains shops. 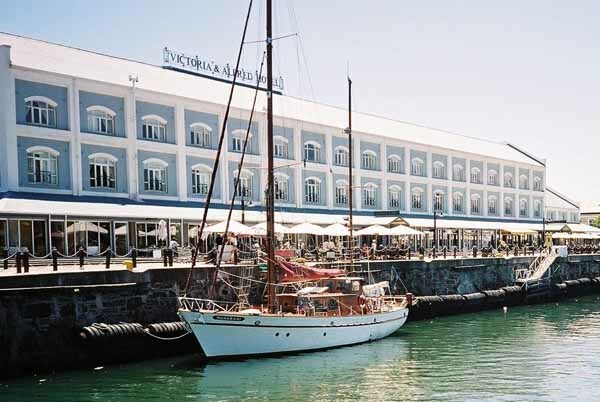 The Cape Grace Hotel is one of two "5 star " hotels to be found in the waterfront. It is a new building and is on the opposite bank to the V and A Hotel. Just behind the yacht in this photo is one of the new residential complexes that are being built in the waterfront. The flats (condominiums) are not very large but cost in excess of a million rand per flat. The third basin in the complex. This is the newest basin in the complex. It was formerly a tank farm which was deepened and then flooded. The narrow entrance to this basin had to be dynamited open after the basin had been flooded. 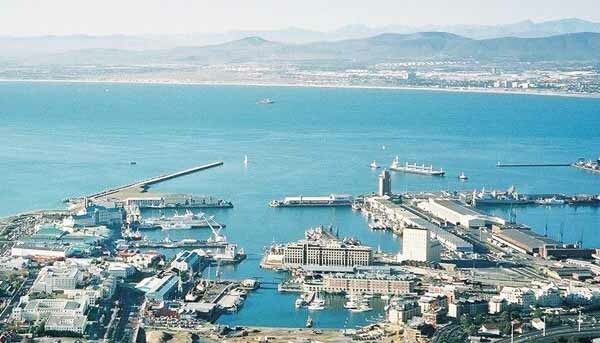 To the left of the basin is the Robinson Dry dock and the new Two Oceans acquarium. To the right are some of the new residential complexes that are being built. The gravel area in the foreground will also eventually contain residential complexes. 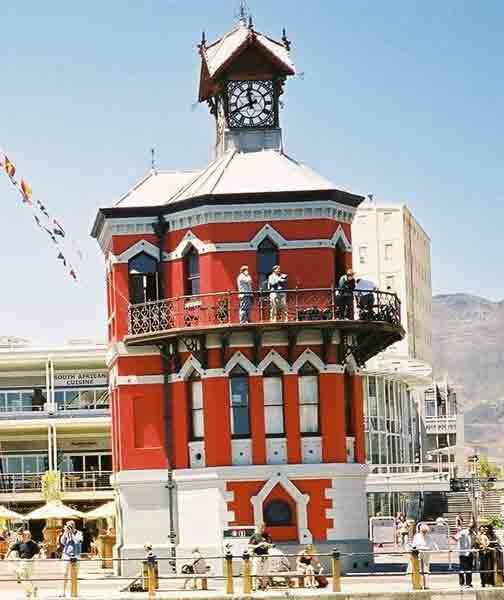 The red brick building on the right is the Cape Grace Hotel and behind it the large white building is part of the Clock Tower Development. 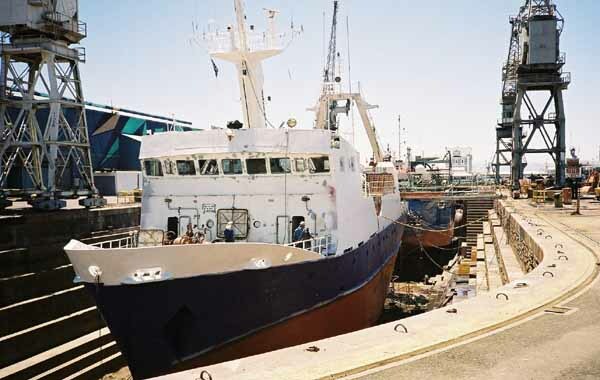 The Robinson Dry Dock is one of two dry docking facilities in the Cape Town harbour complex. The other dock is found in the Duncan Dock at the south end of the harbour.